If you love 1/6 scale action figure, you should know who she is - Yulli Choi, Hot Toys chief sculptor. Yulli is from South Korea, and has more than 10 years sculpting experience. Joined Hot Toys in 2007. Her first project in Hot Toys is Prison Break brothers. Until now, she is already sculpted a lot of impressive head sculpts. Joker is one of them. Her technique is already a big leap forward from the day she just join Hot Toys. Look at the head sculpt of Joker DX08 - Jack Nicholson. You know how much improvement on the details in the hair sculpt and the faces’ fine lines effect. Just like what JC HONG said "The fine detailing of the sculpt today was evolved from [look like a person’s sculpt] of the past to a degree which can be described as [very close to a Human Being]." 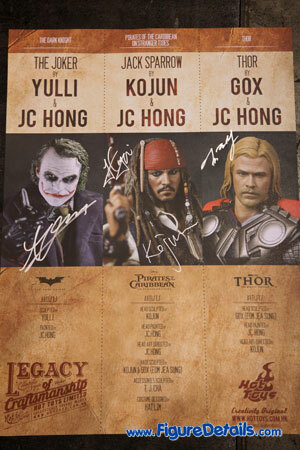 The photos are taken in Hot Toys Korean Figure Artists Autograph Session during 13th Hong Kong Toys Fairs 2011. That’s my first time meet the Korean figure artists. From my impression, Yulli is used to have long hair. But this time she appears with short hair. I do think she looks better in this hair style. This is what Korean Beauty is. For the last photo, from the left, we have Gox, Kojun, Yulli, and JC Hong. I am so sorry that not have enough time to take photo with them one by one. Hope next time, I can do better.